Control Your Weeds Before They Control You! It’s not over yet, but much like last winter, we are seeing unseasonably high temperatures that trigger weed seed germination. If you already see green patches of weeds that sprouted in fall growing in your lawn right now, it’s time to start pulling these weeds, and start your spring mowing early. This simple step will help control these weeds before they can grow strong, bloom and then produce seed for next year, continually coming back year after year. Dandelions are pesky warm weather weeds. What’s your main objective by mowing early? The goal is to remove the the flower heads from the growing weed. To control the weeds, set your mower height a little higher. Be sure not to scalp unnecessarily and can promote stress in your dormant grass. By mowing off the flowers before they go to seed, you can dramatically cut down on the spread of weeds this spring. Growing St. Augustine grass? Learn which height it favors HERE. Your organically maintained lawn can actually be healthier with a bit of diversity. A variety of grasses, including a few weeds, creates an environment more tolerant of pests and diseases, as opposed to a monoculture (only one species) of one warm season grass. Monocultures of plants can lead to large populations of that plant dying out because of diseases specific to it. Eradicating everything is not imperative and some weeds can be tolerated. 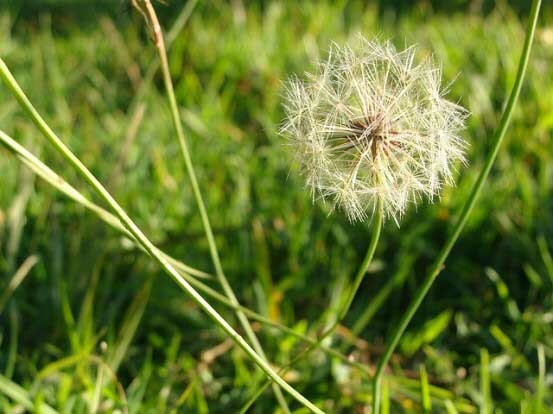 However, certain weeds will take over an area in your lawn and when they complete their life cycle, they leave behind bare patches, an invitation for more weed seeds to plant themselves and colonize. Keep in mind that weeds can sometimes be an indicator of poor soil. Cultivated plants often struggle in soil that is compacted and low in nutrients. Grass won’t grow into brick-like soil, but many weeds thrive in these conditions. Steps to invite grass-runners to begin to grow again. Aeration is effective in problem areas to break up compacted soil. Focusing on smaller spots using a tool specifically for aeration or a digging fork, loosen the dirt and poke a few holes through the surface. Low nutrient soil is typically in need of organic matter. Sprinkling compost into the area now loosened is another way to make it more favorable for grass to regrow. Cultivating healthy soil is the best way to grow vigorous plants and your lawn is no exception. Our job is to help you improve the soil around your home and landscape to make your grass, trees and shrubs flourish.